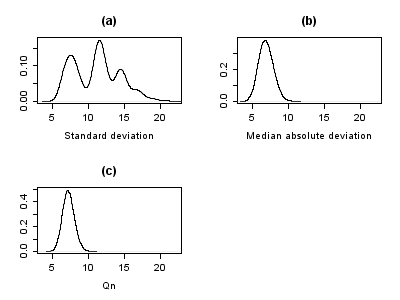 Statistics distributions obtained from Simon Newcomb speed of light dataset obtained through bootstrapping: the final result differs between the standard deviation and the median absolute deviation (both measures of dispersion) distributions. In statistics, bootstrapping is any test or metric that relies on random sampling with replacement. Bootstrapping allows assigning measures of accuracy (defined in terms of bias, variance, confidence intervals, prediction error or some other such measure) to sample estimates. This technique allows estimation of the sampling distribution of almost any statistic using random sampling methods. Generally, it falls in the broader class of resampling methods. Bootstrapping is the practice of estimating properties of an estimator (such as its variance) by measuring those properties when sampling from an approximating distribution. One standard choice for an approximating distribution is the empirical distribution function of the observed data. In the case where a set of observations can be assumed to be from an independent and identically distributed population, this can be implemented by constructing a number of resamples with replacement, of the observed dataset (and of equal size to the observed dataset). It may also be used for constructing hypothesis tests. It is often used as an alternative to statistical inference based on the assumption of a parametric model when that assumption is in doubt, or where parametric inference is impossible or requires complicated formulas for the calculation of standard errors. The bootstrap was published by Bradley Efron in "Bootstrap methods: another look at the jackknife" (1979), inspired by earlier work on the jackknife. Improved estimates of the variance were developed later. A Bayesian extension was developed in 1981. The bias-corrected and accelerated (BCa) bootstrap was developed by Efron in 1987, and the ABC procedure in 1992. The basic idea of bootstrapping is that inference about a population from sample data (sample → population) can be modelled by resampling the sample data and performing inference about a sample from resampled data (resampled → sample). As the population is unknown, the true error in a sample statistic against its population value is unknown. In bootstrap-resamples, the 'population' is in fact the sample, and this is known; hence the quality of inference of the 'true' sample from resampled data (resampled → sample) is measurable. More formally, the bootstrap works by treating inference of the true probability distribution J, given the original data, as being analogous to inference of the empirical distribution Ĵ, given the resampled data. The accuracy of inferences regarding Ĵ using the resampled data can be assessed because we know Ĵ. If Ĵ is a reasonable approximation to J, then the quality of inference on J can in turn be inferred. A great advantage of bootstrap is its simplicity. It is a straightforward way to derive estimates of standard errors and confidence intervals for complex estimators of complex parameters of the distribution, such as percentile points, proportions, odds ratio, and correlation coefficients. Bootstrap is also an appropriate way to control and check the stability of the results. Although for most problems it is impossible to know the true confidence interval, bootstrap is asymptotically more accurate than the standard intervals obtained using sample variance and assumptions of normality. Although bootstrapping is (under some conditions) asymptotically consistent, it does not provide general finite-sample guarantees. The apparent simplicity may conceal the fact that important assumptions are being made when undertaking the bootstrap analysis (e.g. independence of samples) where these would be more formally stated in other approaches. The number of bootstrap samples recommended in literature has increased as available computing power has increased. If the results may have substantial real-world consequences, then one should use as many samples as is reasonable, given available computing power and time. Increasing the number of samples cannot increase the amount of information in the original data; it can only reduce the effects of random sampling errors which can arise from a bootstrap procedure itself. Moreover, there is evidence that numbers of samples greater than 100 lead to negligible improvements in the estimation of standard errors. In fact, according to the original developer of the bootstrapping method, even setting the number of samples at 50 is likely to lead to fairly good standard error estimates. When the theoretical distribution of a statistic of interest is complicated or unknown. Since the bootstrapping procedure is distribution-independent it provides an indirect method to assess the properties of the distribution underlying the sample and the parameters of interest that are derived from this distribution. When the sample size is insufficient for straightforward statistical inference. If the underlying distribution is well-known, bootstrapping provides a way to account for the distortions caused by the specific sample that may not be fully representative of the population. When power calculations have to be performed, and a small pilot sample is available. Most power and sample size calculations are heavily dependent on the standard deviation of the statistic of interest. If the estimate used is incorrect, the required sample size will also be wrong. One method to get an impression of the variation of the statistic is to use a small pilot sample and perform bootstrapping on it to get impression of the variance. However, Athreya has shown that if one performs a naive bootstrap on the sample mean when the underlying population lacks a finite variance (for example, a power law distribution), then the bootstrap distribution will not converge to the same limit as the sample mean. As a result, confidence intervals on the basis of a Monte Carlo simulation of the bootstrap could be misleading. Athreya states that "Unless one is reasonably sure that the underlying distribution is not heavy tailed, one should hesitate to use the naive bootstrap". In univariate problems, it is usually acceptable to resample the individual observations with replacement ("case resampling" below) unlike subsampling, in which resampling is without replacement and is valid under much weaker conditions compared to the bootstrap. In small samples, a parametric bootstrap approach might be preferred. For other problems, a smooth bootstrap will likely be preferred. For regression problems, various other alternatives are available. Bootstrap is generally useful for estimating the distribution of a statistic (e.g. mean, variance) without using normal theory (e.g. z-statistic, t-statistic). Bootstrap comes in handy when there is no analytical form or normal theory to help estimate the distribution of the statistics of interest, since bootstrap methods can apply to most random quantities, e.g., the ratio of variance and mean. There are at least two ways of performing case resampling. The Monte Carlo algorithm for case resampling is quite simple. First, we resample the data with replacement, and the size of the resample must be equal to the size of the original data set. Then the statistic of interest is computed from the resample from the first step. We repeat this routine many times to get a more precise estimate of the Bootstrap distribution of the statistic. different resamples, where n is the size of the data set.
. We first resample the data to obtain a bootstrap resample. An example of the first resample might look like this X1* = x2, x1, x10, x10, x3, x4, x6, x7, x1, x9. Note that there are some duplicates since a bootstrap resample comes from sampling with replacement from the data. Note also that the number of data points in a bootstrap resample is equal to the number of data points in our original observations. Then we compute the mean of this resample and obtain the first bootstrap mean: μ1*. We repeat this process to obtain the second resample X2* and compute the second bootstrap mean μ2*. If we repeat this 100 times, then we have μ1*, μ2*, ..., μ100*. This represents an empirical bootstrap distribution of sample mean. From this empirical distribution, one can derive a bootstrap confidence interval for the purpose of hypothesis testing. In regression problems, case resampling refers to the simple scheme of resampling individual cases – often rows of a data set. For regression problems, so long as the data set is fairly large, this simple scheme is often acceptable. However, the method is open to criticism. In regression problems, the explanatory variables are often fixed, or at least observed with more control than the response variable. Also, the range of the explanatory variables defines the information available from them. Therefore, to resample cases means that each bootstrap sample will lose some information. As such, alternative bootstrap procedures should be considered. are then interpretable as posterior distributions on that parameter. Under this scheme, a small amount of (usually normally distributed) zero-centered random noise is added onto each resampled observation. This is equivalent to sampling from a kernel density estimate of the data. In this case a parametric model is fitted to the data, often by maximum likelihood, and samples of random numbers are drawn from this fitted model. Usually the sample drawn has the same sample size as the original data. Then the quantity, or estimate, of interest is calculated from these data. This sampling process is repeated many times as for other bootstrap methods. The use of a parametric model at the sampling stage of the bootstrap methodology leads to procedures which are different from those obtained by applying basic statistical theory to inference for the same model. Another approach to bootstrapping in regression problems is to resample residuals. The method proceeds as follows. where j is selected randomly from the list (1, ..., n) for every i.
Repeat steps 2 and 3 a large number of times. This scheme has the advantage that it retains the information in the explanatory variables. However, a question arises as to which residuals to resample. Raw residuals are one option; another is studentized residuals (in linear regression). Although there are arguments in favour of using studentized residuals; in practice, it often makes little difference, and it is easy to compare the results of both schemes. When data are temporally correlated, straightforward bootstrapping destroys the inherent correlations. This method uses Gaussian process regression to fit a probabilistic model from which replicates may then be drawn. Gaussian processes are methods from Bayesian non-parametric statistics but are here used to construct a parametric bootstrap approach, which implicitly allows the time-dependence of the data to be taken into account. A distribution suggested by Mammen (1993). The block bootstrap is used when the data, or the errors in a model, are correlated. In this case, a simple case or residual resampling will fail, as it is not able to replicate the correlation in the data. The block bootstrap tries to replicate the correlation by resampling instead blocks of data. The block bootstrap has been used mainly with data correlated in time (i.e. time series) but can also be used with data correlated in space, or among groups (so-called cluster data). In the (simple) block bootstrap, the variable of interest is split into non-overlapping blocks. In the moving block bootstrap, introduced by Künsch (1989), data is split into n − b + 1 overlapping blocks of length b: Observation 1 to b will be block 1, observation 2 to b + 1 will be block 2, etc. Then from these n − b + 1 blocks, n/b blocks will be drawn at random with replacement. Then aligning these n/b blocks in the order they were picked, will give the bootstrap observations. This bootstrap works with dependent data, however, the bootstrapped observations will not be stationary anymore by construction. But, it was shown that varying randomly the block length can avoid this problem. This method is known as the stationary bootstrap. Other related modifications of the moving block bootstrap are the Markovian bootstrap and a stationary bootstrap method that matches subsequent blocks based on standard deviation matching. Cluster data describes data where many observations per unit are observed. This could be observing many firms in many states, or observing students in many classes. In such cases, the correlation structure is simplified, and one does usually make the assumption that data is correlated within a group/cluster, but independent between groups/clusters. The structure of the block bootstrap is easily obtained (where the block just corresponds to the group), and usually only the groups are resampled, while the observations within the groups are left unchanged. Cameron et al. (2008) discusses this for clustered errors in linear regression. The bootstrap distribution of a point estimator of a population parameter has been used to produce a bootstrapped confidence interval for the parameter's true value, if the parameter can be written as a function of the population's distribution. Population parameters are estimated with many point estimators. Popular families of point-estimators include mean-unbiased minimum-variance estimators, median-unbiased estimators, Bayesian estimators (for example, the posterior distribution's mode, median, mean), and maximum-likelihood estimators. A Bayesian point estimator and a maximum-likelihood estimator have good performance when the sample size is infinite, according to asymptotic theory. For practical problems with finite samples, other estimators may be preferable. Asymptotic theory suggests techniques that often improve the performance of bootstrapped estimators; the bootstrapping of a maximum-likelihood estimator may often be improved using transformations related to pivotal quantities. The bootstrap distribution of a parameter-estimator has been used to calculate confidence intervals for its population-parameter. Bias: The bootstrap distribution and the sample may disagree systematically, in which case bias may occur. If the bootstrap distribution of an estimator is symmetric, then percentile confidence-interval are often used; such intervals are appropriate especially for median-unbiased estimators of minimum risk (with respect to an absolute loss function). Bias in the bootstrap distribution will lead to bias in the confidence-interval. Otherwise, if the bootstrap distribution is non-symmetric, then percentile confidence-intervals are often inappropriate. See Davison and Hinkley (1997, equ. 5.18 p. 203) and Efron and Tibshirani (1993, equ 13.5 p. 171). This method can be applied to any statistic. It will work well in cases where the bootstrap distribution is symmetrical and centered on the observed statistic and where the sample statistic is median-unbiased and has maximum concentration (or minimum risk with respect to an absolute value loss function). In other cases, the percentile bootstrap can be too narrow. When working with small sample sizes (i.e., less than 50), the percentile confidence intervals for (for example) the variance statistic will be too narrow. So that with a sample of 20 points, 90% confidence interval will include the true variance only 78% of the time. Some give a general warning against using the percentile bootstrap in favour of the basic bootstrap; according to Rice, "Although this direct equation of quantiles of the bootstrap sampling distribution with confidence limits may seem initially appealing, it’s rationale is somewhat obscure." is the estimated standard error of the coefficient in the original model. The studentized test enjoys optimal properties as the statistic that is bootstrapped is pivotal (i.e. it does not depend on nuisance parameters as the t-test follows asymptotically a N(0,1) distribution), unlike the percentile bootstrap. Bias-corrected bootstrap – adjusts for bias in the bootstrap distribution. Accelerated bootstrap – The bias-corrected and accelerated (BCa) bootstrap, by Efron (1987), adjusts for both bias and skewness in the bootstrap distribution. This approach is accurate in a wide variety of settings, has reasonable computation requirements, and produces reasonably narrow intervals. is the mean of the combined sample. values of the test statistic. when condition is true and 0 otherwise. In 1878, Simon Newcomb took observations on the speed of light. The data set contains two outliers, which greatly influence the sample mean. (Note that the sample mean need not be a consistent estimator for any population mean, because no mean need exist for a heavy-tailed distribution.) A well-defined and robust statistic for central tendency is the sample median, which is consistent and median-unbiased for the population median. 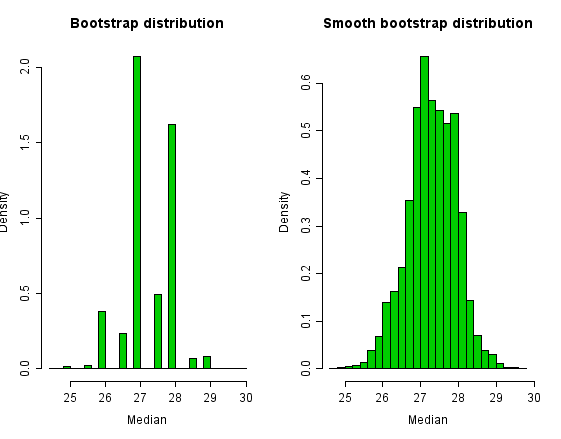 Histograms of the bootstrap distribution and the smooth bootstrap distribution appear below. The bootstrap distribution of the sample-median has only a small number of values. The smoothed bootstrap distribution has a richer support. In this example, the bootstrapped 95% (percentile) confidence-interval for the population median is (26, 28.5), which is close to the interval for (25.98, 28.46) for the smoothed bootstrap. cross-validation, in which the parameters (e.g., regression weights, factor loadings) that are estimated in one subsample are applied to another subsample. For more details see bootstrap resampling. Bootstrap aggregating (bagging) is a meta-algorithm based on averaging the results of multiple bootstrap samples. In situations where an obvious statistic can be devised to measure a required characteristic using only a small number, r, of data items, a corresponding statistic based on the entire sample can be formulated. Given an r-sample statistic, one can create an n-sample statistic by something similar to bootstrapping (taking the average of the statistic over all subsamples of size r). This procedure is known to have certain good properties and the result is a U-statistic. The sample mean and sample variance are of this form, for r = 1 and r = 2. ^ Varian, H.(2005). "Bootstrap Tutorial". Mathematica Journal, 9, 768–775. ^ Efron, B. (1979). "Bootstrap methods: Another look at the jackknife". The Annals of Statistics. 7 (1): 1–26. doi:10.1214/aos/1176344552. ^ a b Efron, B. (1987). "Better Bootstrap Confidence Intervals". Journal of the American Statistical Association. Journal of the American Statistical Association, Vol. 82, No. 397. 82 (397): 171–185. doi:10.2307/2289144. JSTOR 2289144. ^ Goodhue, D.L., Lewis, W., & Thompson, R. (2012). Does PLS have advantages for small sample size or non-normal data? MIS Quarterly, 36(3), 981–1001. ^ Efron, B., Rogosa, D., & Tibshirani, R. (2004). Resampling methods of estimation. In N.J. Smelser, & P.B. Baltes (Eds.). International Encyclopedia of the Social & Behavioral Sciences (pp. 13216–13220). New York, NY: Elsevier. ^ Rubin, D. B. (1981). "The Bayesian bootstrap". Annals of Statistics, 9, 130. ^ Wu, C.F.J. (1986). "Jackknife, bootstrap and other resampling methods in regression analysis (with discussions)". Annals of Statistics. 14: 1261–1350. doi:10.1214/aos/1176350142. ^ Mammen, E. (Mar 1993). "Bootstrap and wild bootstrap for high dimensional linear models". Annals of Statistics. 21 (1): 255–285. doi:10.1214/aos/1176349025. ^ Künsch, H. R. (1989). "The Jackknife and the Bootstrap for General Stationary Observations". Annals of Statistics. 17 (3): 1217–1241. doi:10.1214/aos/1176347265. ^ Politis, D. N.; Romano, J. P. (1994). "The Stationary Bootstrap". Journal of the American Statistical Association. 89 (428): 1303–1313. doi:10.1080/01621459.1994.10476870. ^ Cameron, A. C.; Gelbach, J. B.; Miller, D. L. (2008). "Bootstrap-based improvements for inference with clustered errors". Review of Economics and Statistics. 90 (3): 414–427. doi:10.1162/rest.90.3.414. ^ Davison, A. C.; Hinkley, D. V. (1997). Bootstrap methods and their application. Cambridge Series in Statistical and Probabilistic Mathematics. Cambridge University Press. ISBN 0-521-57391-2. software. ^ Efron, B. (1982). The jackknife, the bootstrap, and other resampling plans. 38. Society of Industrial and Applied Mathematics CBMS-NSF Monographs. ISBN 0-89871-179-7. ^ Scheiner, S. (1998). Design and Analysis of Ecological Experiments. CRC Press. ISBN 0412035618. ^ Rice, John. Mathematical Statistics and Data Analysis (2 ed.). p. 272. ^ Orloff, Jeremy; Bloom, Jonathan. "Bootstrap confidence intervals" (PDF). Efron, B. (1981). "Nonparametric estimates of standard error: The jackknife, the bootstrap and other methods". Biometrika. 68 (3): 589–599. doi:10.1093/biomet/68.3.589. Hesterberg, T. C.; D. S. Moore; S. Monaghan; A. Clipson & R. Epstein (2005). "Bootstrap methods and permutation tests". In David S. Moore & George McCabe (eds.). Introduction to the Practice of Statistics (PDF). software. Archived from the original (pdf) on 2006-02-15. Retrieved 2007-03-23. Statistics101: Resampling, Bootstrap, Monte Carlo Simulation program. Free program written in Java to run on any operating system.